We stopped at Wat Suan Plu yesterday during a food walk (most enjoyable). It was only a short visit, and I will definitely revisit this beautiful little temple the next time I’m back in Bangkok. According to our guide, the locals hid here when Bangkok was bombed during the War. I had no idea that Bangkok was bombed, and will have do some sleuthing around the Internet when I have a chance. Located close to the Shangrila Hotel in one of the oldest sections of the city. The closest Sky train station is Saphan Taksin (Exit 3). What beautiful detail. 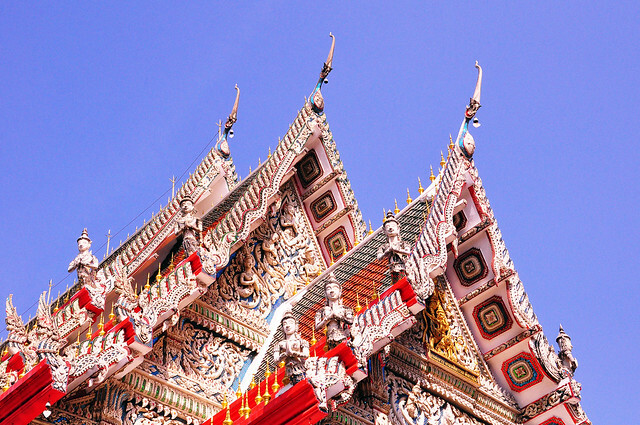 Thai style temple roofs are just so exotic. I had no idea about the bombing, either. I hope that you could visit it again as soon as possible. I want to see how beautiful it really looks like. Please take more pictures of it when you get back there. Looks like you had a great day for shooting. Beautiful sky. Yes, it was a beautiful day. Love the gorgeous skies of Thailand when taking photos.